This experience was, in a word, terrifying. I wish I could tell you some inspiring story about how I worked up the courage to bare my soul to the world for the benefit of contributing to the dialogue on mental health in modern society, but that just wasn't the case. Over the years, I've developed a large number of coping strategies for dealing with anxiety and stressful situations. One of these coping strategies is straight up ignoring the situation I'm in. So, that's how I found myself able to be so vulnerable on the internet. I'm still pretty nervous about having shared this thing that I tried so hard to keep hidden for so long. It's particularly nerve-wracking thinking about everyone who's read it. Sure, that was what I expected when I shared this on Facebook and Instagram, but it's still weird to think about. I'm friends with everyone on Facebook: my extended family, friends of my mom, my boyfriend's family, the popular kids from high school, people I've been in professional meetings with, etc.. To think that any of these people may have read such a personal story makes me really anxious, but the positive reinforcement I got from sharing my story makes me think the anxiety might be worth it. 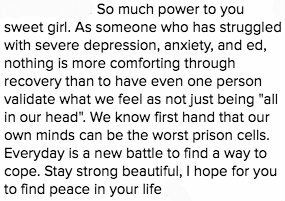 It's strange to think that exactly a year ago, I was reading the Survival Stories on Life Ain't Easy But It's Worth It and thinking that I could never speak so honestly about my demons the way these inspiring young women did. Their stories inspired me to keep going and stay strong, even in the face of severe hardships. Maybe my story will do the same for someone else.